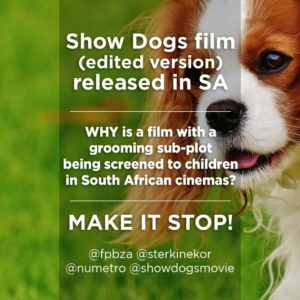 The film, “Show Dogs”, is set for release by Nu Metro and Ster-Kinekor on 6 July 2018. At first glance the film – described as a fun adventure comedy – looks like a great school holiday choice that the whole family can enjoy. However, the film contains scenes that send a disturbing message that grooms children for sexual abuse. The current age restriction assigned by the Films and Publications Board (FPB) – 7-9 PG – is far too low, given the harmful messages it communicates. At the current age restriction, any 10-year-old can go see the movie without the presence and guidance of a parent/guardian. The main character, an undercover police dog, competes in a dog show to rescue a kidnapped baby panda. To qualify for the final round, he is required to have his private parts inspected. Although he is very uncomfortable with the unwanted intimate touching and wants it to stop, he is told to endure the discomfort by going to his ‘happy place’ for the sake of receiving the reward of qualifying for the final round and rescuing the baby panda. These scenes are disturbing because child abusers use these tactics when grooming children for sexual abuse. Abusers tell children to pretend they are somewhere else (like going to a ‘happy place’) and promise children rewards (similar to qualifying for the final round and rescuing the baby panda) for enduring the discomfort of the sexual abuse. Children’s films should not send dangerous and confusing messages that endorse unwanted genital and other intimate touching. Children need to know that they have bodily autonomy and the ability to say ‘no’. There is also a concern that children, not realising what they are doing, may play-act the inappropriate scenes with other children and/or house pets. This film arrives on South African shores at a time when child sexual abuse is a major problem in our society and equally worrying, child-on-child sexual abuse is on the rise. In the best interest of the children of South Africa, a film containing scenes justifying unwanted genital and other intimate touching, should not be distributed AT ALL. However, a film containing potential grooming scenes, cannot be rated lower than “16”. Request the Appeal Tribunal to re-classify the film with a “16” or higher age restriction. We have requested Nu Metro and Ster-Kinekor, in addition to the above, to also refrain from releasing the film until the inappropriate scenes have been cut or the age restriction has been raised appropriately. We have also screened the film released in South African cinemas and unfortunately can confirm that the inappropriate scenes/references and storyline have also made it to South African shores. On 28 June 2018, the Minister of Communications granted our request and referred the film to the Appeal Tribunal of the FPB. A HUGE THANK YOU to each of our supporters who have taken part in this action drive! You have made a significant difference in making the progress we have seen so far a reality. The FPB, relying on an incorrect interpretation of the law, seem to want to refuse the Minister’s appeal to the Appeal Tribunal. 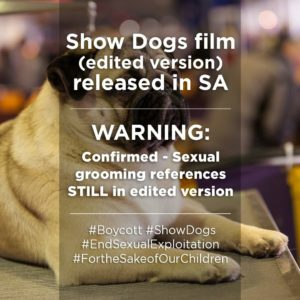 Filmfinity (previously Ster-Kinekor’s distribution arm) has confirmed that it is in possession of both versions (original and edited) of Show Dogs and is willing to provide us with a private screening of the film prior to its general release. Disappointingly however, we have not yet received any response from Nu Metro. We are also alerting parents and guardians, communities and other stakeholders to the harmful messages/references inShow Dogs, to enable parents to make film viewing choices that will protect their children, and to speak up and take action against this injustice.